With a few exceptions, I have always lived on the coast. My dad was a submariner in the US Navy and well…submariners need to be where the deep water is. So I lived a blessed childhood growing up in places like Hawaii, Guam, Charleston, SC and San Diego, CA. When Terry and I moved to Nashville, TN for a job, I was pretty excited to live ‘kind of' in the ‘heartland'. And while I loved Nashville, I always felt a little like a fish out of water so when the opportunity came, we went back to the shore and will probably always live close to the ocean. Guess that makes me a mermaid of sorts. All this to say, while I wouldn't say I am a full on ‘coastal decor' gal, I do welcome those pops of the sea scattered throughout our home. 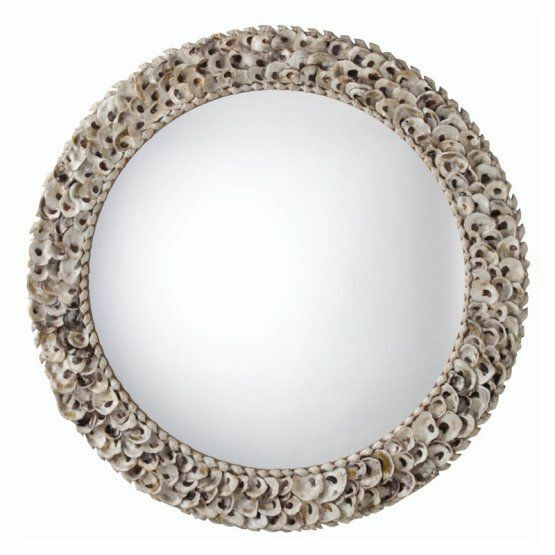 For several years I've been hankering for an Oyster Shell Mirror. I've seen them at various stores, but could never justify the hefty price tag. This one is the perfect size, but I couldn't quite swallow the $1,000+ ticket. Since I had many bushels of oysters from a past project sitting in my garage, the seed (or pearl?) was planted that I could make one myself. And since I just never really loved the stenciled mirror I made several months ago, I had the round piece of wood with a mirror in the middle. With those two critical oyster shell mirror ‘ingredients' sitting in my home, it was just a matter of taking the time to put 2 and 2 together. I started this project months ago, but it just wasn't coming together for me. I was using E6000 glue which I find useful for most things, but it just wasn't ideal for this project. I needed something that was tacky and stiff enough to hold the shells in place while I moved them to where I wanted and that was also easy to apply. After going through 2 tubes of E6000 on only 1/4 of the mirror, I knew I needed to find a different adhesive. And while I was noodling adhesives, this mirror with a few oyster shells glued around it lay in the garage, dodging cars and bikes and a teenage boy on his way to the spare fridge. Shockingly, it refused to break…which was a constant reminder to me that Kismet wanted me to figure it out. I initially thought of plaster of paris, but was afraid that would add weight that I didn't really want on something that was going to hang on the wall. In terms of where to find oyster shells, you can surely buy them online…but, if you're willing to work just a wee bit, you might be able to get them for free. If you have a fish market or restaurant that sells shucked oysters, call to see if you can collect the shells. Our fish markets have piles outside their back door that they are more than willing to let me pick through. 40-50 pounds of cleaned oyster shells. I soaked them in bleach water and then scrubbed any yuck off. I then let them dry in the sun for a couple of days. You won't use all 40-50 pounds, in fact you'll only need about half that, but that should give you more than enough to pick through for the right sizes/shapes. TEC Stick n Stay, 1 quart is all I needed for this project and I have about 1/3 of the quart remaining. You can find it in the flooring department of your hardware store. This stuff made the project so very easy and easily accomplished in a morning…granted, I started at 6 a.m.
We get most of our building supplies, like the plywood and putty knife I used, at Home Depot. They have a wonderful program by which you can order here online and then pick-up at your nearest store within hours or at your convenience. It's easier if you attach your hanging hardware on to the back of your wood before your put your oysters on…ask me how I know! Make sure your wood is clean and primed. I had some leftover silver paint on parts of mine and the adhesive really didn't want to stick there. I had to go back in and sand that part after the oysters still weren't sticking several days later. Placing the oysters on the mirror is best likened to putting a puzzle together. I wanted them to get bigger in size as I went out from the middle, but not all oyster shells ‘layer' with each other well. This is why it's a good thing to have more than you need so that you can pick and chose the ones that work best. I put a good glob of the Stick n Stay on the parts of the oyster shell that would be touching the board or other shells. When all the oysters were in place, I glued ‘tiny white cup shells' (yup, that's the name) along the edge of the mirror to finish it off. I LOVE THIS MIRROR!!!! It really turned out so much better than I had hoped and was really easy to make. It took me several hours, I spent one full morning on it…but it really was quite fun figuring out what shell would work where…like I said, it was a bit of a puzzle. And it is the perfect dash of coastal that I wanted in our bedroom. As always, I am so thankful that you decided to spend a few minutes of your precious time with me today. I appreciate your company and your comments more than you can know. If you want to make sure you don’t miss future content, pop your email in the beige box up on the right or click here. I usually send out 2-3 emails a week, so I won’t inundate your inbox. I have published printable PDFs of several of my most popular printables and knit patterns and have made those available to all of my subscribers. Come back and check every now and again. I will continue to add patterns and printables to this page as we go along. I don’t comment much, so I wanted to let you I appreciate you and your blog! I, too, live on the coast – Gulf Coast of Florida – and this is my next project! Thanks. Hi Linda! I’m so glad you stopped by and thanks for your kind comments. I am familiar with the Gulf Coast…have family down there…so pretty sure you’ll be able to get your hands on some good oysters. Have fun with your project! I don’t comment much. I just wanted to let you know how much I like and appreciate your blog. This project is next on my list! I’m Gulf Coast girl! This will look sooooo good in my home, Thanks. Hey Linda! Well all the more reason for me to thank you for taking the time to comment today! And thanks too for your kind and encouraging words. I know you’ll be able to get your hands on some oyster shells in your area…my husband’s family spent a good deal of time in Panama City and so know you all have access to great seafood down there. Thanks again for stopping by and wishing you a fantastic weekend. Wow you brought a whole new level of amazing beauty to oyster shells. I grew up off Puget sound in a fishing family which means oysters were always for dinner often. I love this project looks fun and so simple to make. Thanks for sharing I have a friend who will also love this. Oh Carole I am so glad you might have found a wee bit of inspiration…and glad your friend might enjoy it. It was really easy to put together once I figured it out and I do so love it. Oh wow, Lynn! I love yours so much more than your inspiration frame. It’s so beautiful. Pinning for sure! Aw thanks Robin! I am really so pleased with it…and had a good time putting it together. I’d do it again in a second. Lynn this is absolutely stunning! It makes quite a statement when you walk into the room. Sadly we don’t have oysters around my way but if they did I would definitly try this. Lynn, I REALLY love this mirror! I’ve always wanted to try making a seashell frame for a mirror, but even that takes a ton of work and using the right shapes and sizes in the right places. Using these oyster shells look a tad easier and its gorgeous! Lynn, Lake Michigan is all fresh water which means zero oysters! If you’ve got tons to spare or could get your hands on more, I’ll gladly pay you if you bring them to Haven with you. I’m actually driving down from Michigan this year and hope to hook up with Tammy along the way! Thanks Marci…it really looks great in my room with all the subtle and calm colors in there. I would make another in a minute…really quite a fun project once I figured out the right adhesive. Lynn yours is far more beautiful than the inspiration piece! Just had oysters last night. We live in RI so will have to start saving to copy. Gorgeous! Hey there Kim…thanks for that lovely compliment. I have to say, I really do adore everything about that mirror…way up there on the list of ‘favorite things I have made’. And surely you have some fish stores that will let you come raid their discards!! Thanks so much for taking a minute out of your day to send those kind words! Wishing you a lovely rest of your Sunday and a relaxing Labor Day. Hi Lynn! This is rhe most beautiful oyster shell mirror I have ever seen. I am going to attempt to make one. I am cleaning the shells now. I too am originally from Panama City and now live on the Alabama coast. I once lived in north Georgia, so I understand about being a “fish out of water”. I used to say that all the time. Could you give me an idea of how large your mirror is and how large the circumference is? Also would you share what you used to hang it with? Thank you! Aw thanks Yvonne my friend! I’m still pretty smitten with it myself! It’s always a good thing when the image I have in my mind actually comes to fruition. The mirror is, from end of oyster shell to end of oyster shell, 34″ in diameter and the mirror is 14″. I wish I could tell you exactly what I used to hang it up, but I didn’t save the packaging (bad me! )…but I can tell you that I got it at Home Depot in the picture hanging stuff area and both the attachments on the back of the mirror and the hanger in the wall were for heavy (maybe 50 lbs?) items. I hope that helps my friend! Thank you so very much Lynn. I just hope mine will look half as nice as yours. I was smitten when I set eyes on yours! Have a wonderful evening! 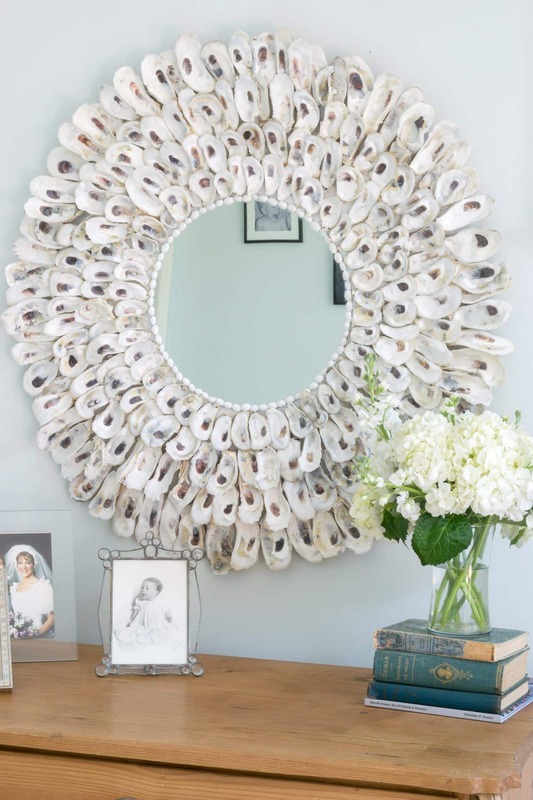 I love the oyster shell mirror so I decided to start collecting oyster shells! My question is, can I use an old mirror with a wood frame? Would that be too heavy when the shells are on? Hi Guia, It’s hard to say if that would be too heavy. I know my mirror weighs about 20 pounds. I was able to find hangers that accommodated 50 lbs at Home Depot. Let me know what you decide to do. Hey lynn – could I glue the oyster shells directly into the mirror? I have one that came with the house and it’s huge as is so I wouldn’t add any plywood to it. Let me know! I really don’t know! I have never glued on to mirror before, but if I did I would try Loctite PL® 520 Mirror Adhesive. Pop back and let me know what worked for you! Aw, thanks Stacie! It truly is one of my favorite ‘things I’ve made’. It is just regular plywood, 1/4″ thick. The board is 32″ in diameter and the oysters extend about another each all the way around, making the board 34.5″ diameter. Have fun making it! It really is easy, a little like a puzzle piece. Went together much quicker than I thought it would. Don’t paint your board, but make sure the board and oysters are free from dirt/debris to get a good ‘stick’.